Come be a part of the action and bring your business to the Iowa City Downtown District! 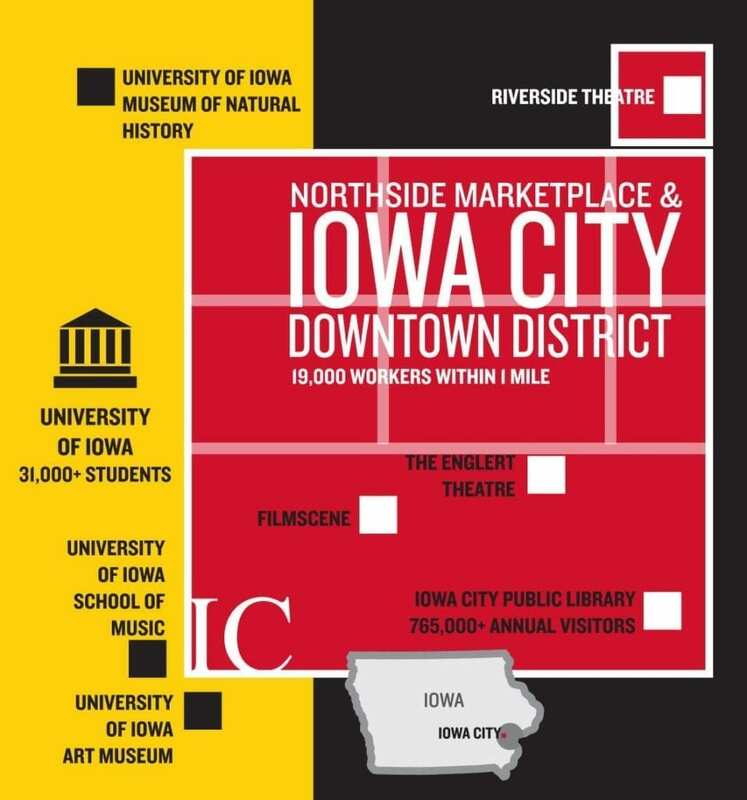 Downtown Iowa City offers a rare retail opportunity to capture the market potential of University of Iowa students, faculty, and affiliated visitors, as well as the value that comes along with being a regional shopping and entertainment hub. Companies seeking a retail or office location in a vibrant, walkable, urban environment with a wide variety of amenities desirable by today’s 21st century workforce will want to be here. See all of our current available spaces and join us in downtown Iowa City! Roughly 20,000 employees located within 1 mile of Downtown and over 1,100 Downtown residents. “Iowa’s Most Walkable City” with the highest pedestrian traffic counts and Walk Score in the State. Directly adjacent to UI campus with 32,000 students and over 30,000 faculty and staff. Home to over 15 entertainment and cultural venues with over 1,000 live music performances per year. Home to Iowa’s busiest public library system with 825,000 visitors per year, more visitors than all UI home football games combined. Home to the central location of the City and UI’s integrated public transportation hub that serves over 70,000 residents with free access to the UI CAMBUS system. First hour of parking in Downtown parking ramps is free to encourage frequent visitation from Iowa City area residents. The ICDD works in tandem with City of Iowa City staff to ensure those looking to locate Downtown have the information they need to make critical investment decisions. The mission of the ICDD team is to improve and enhance Downtown and Northside Neighborhoods and bring investment and new businesses to the area. We work with many community partners to ensure collaboration as needed to support new business or entrepreneurial efforts. The ICDD works in tandem with City of Iowa City staff to ensure those looking to locate Downtown have the information they need to make critical investment decisions. This page includes resources where our staff and the City of Iowa City staff collaborate to support members. The ICDD is proud to provide marketing services that help Downtown businesses reach their full potential. Downtowniowacity.com has become more than just a site about the ICDD – it is the resource for everything that is happening in the commercial core. Take advantage of our tools and services to promote your business online and in the community. Our comprehensive and searchable business and organization listing is the most complete resource for residents, employees, and visitors in the region. We use this information to create dining and retail guides, maps, and marketing campaigns for the benefit of the entire District. Companies seeking a retail or office lease or development support should contact the Iowa City Downtown District. The ICDD supports this non-commissioned position to ensure that the area has a healthy mix of complimentary businesses that meets the Downtown District’s mission. Inquiries are confidential and without fee. If you host or organize events that take place within the ICDD, you are welcome to submit them for posting on our featured events listing. We accept submissions through our online Event Submission Form, which allows us to quickly review and post your events as you would like them to appear. Approved events will display within 2-3 business days. Occupying the pedestrian mall, closing streets or sidewalks, or utilizing public space for an event often requires a permit from the City of Iowa City. Visit the City’s website to review permitting needs. Join the ICDD Retail or Restaurant Caucuses to get connected with local business owners, marketing, advertising, PR, and event planning leads. As a member of these Caucuses, you have unique opportunities to stay in the know and create community. The Caucuses are business-driven and are a joint initiative of the ICDD. Monthly meetings for the Retail Caucus are held the 1st Thursday of each month from 9:00am to 10:00am at various locations. Restaurant Caucuses are held quarterly. Once a month the ICDD facilitates a happy hour gathering at Downtown establishments. “First Round” is open to anyone (no RSVP necessary) and features conversation and stories from creative influencers in both the business and arts communities. Different Iowa City-area business sponsor the event each month by buying the first round of drinks for all attendees. Follow “First Round” on Facebook for updated information. For more information on any of these items, please email [email protected] or visit our contact page to send us a message. The ICDD has gathered or produced the following reports and resources intended to better inform those interested in learning about the area’s market economy, planned public investments, and the ICDD’s intention with strategic planning and business recruitment and retention.